Bob Baffert's horse goes wire to wire to win racing's most coveted trifecta. “Test of the Champion”? More like “Proof of a Champion.” At the 150th Belmont Stakes—the third and final leg of the Triple Crown—trainer Bob Baffert, who first won horse racing’s most coveted trifecta in 2015 with American Pharoah, has done it again three years later. The undefeated Justify, who went 6-0 and won the 2018 Kentucky Derby, Preakness Stakes and today went wire to wire in the $1.5 million Belmont, has become the 13th Triple Crown winner in history. 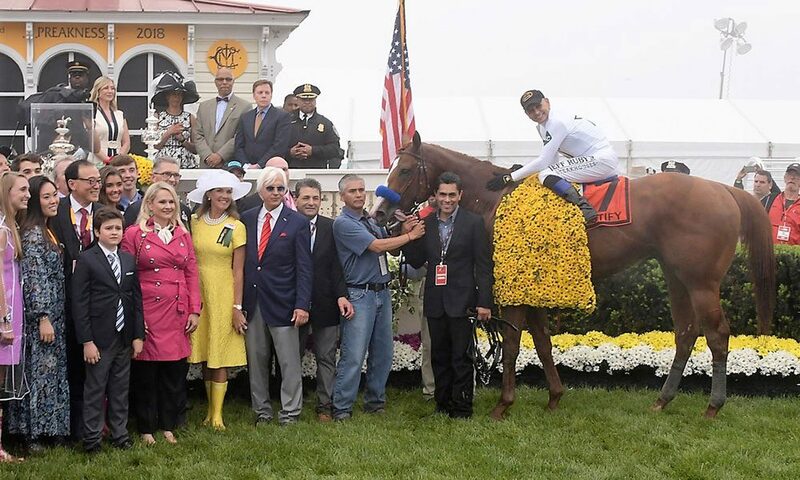 Justify was expertly piloted by Hall of Famer Mike Smith, who also hit the history books, becoming the oldest jockey at age 52 to win a Triple Crown. It was gravy for Smith’s already star-studded career, which included a pair of Derby and Preakness victories, and a trio of Belmonts. Smith was inducted into the Racing Hall of Fame in 2003. Had you read saratoga living columnist Joe “Woody” Wood’s latest column, you would’ve been more than prepared to punch your winning ticket. With Justify the clear favorite going into the race, Woody noted “play a $2.00 bet on Justify, and smile when he wins the Triple Crown, but don’t expect too much return on investment.” Sure, the payout wasn’t spectacular—just $3.60 for a win bet—you at least have the peace of mind that you did the right thing. (Horses Gronkowski and Hofburg placed and showed in the race.) Had you taken Woody’s advice a step further and gone the exotics route, your smile might be a bit wider than normal. Had you dialed in a Pick 6, for instance, you would’ve won north of $80,000. We’re not going to rest on our laurels too long, though; our pick going into this year’s Kentucky Derby was Good Magic, who managed to eke out a second-place finish in the race. Horse racing’s a game of numbers as much as it one of skill. Better luck next year, I guess? All betting aside, today’s all about the powerhouse trifecta of Bob Baffert, Mike Smith and Justify. Welcome to the history books!